Crawley Town interim manager Dean Saunders blamed his side conceding too many free-kicks which allowed Yeovil to pile on the pressure when Reds looked on course for victory. He said: “We gave four fouls away in the first half and then gave 14 fouls away in the second half, after I’d said to them don’t foul. 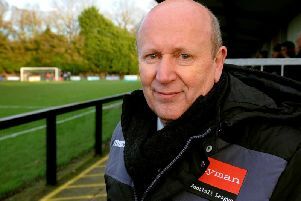 “We had a chance to go 2-0 up right after half-time and if Gwion Edwards scores there, he’s through on the keeper, then we probably go on to win the game. “But we kept giving fouls away and they were punting the ball into the middle of our goal and we didn’t deal with it. Eventually it cost us. “The free-kick for the first goal was a good delivery in, Lewis Price has come for it and not got there and it’s 1-1. Crawley have only won one league game on the road all season, and that came on the opening day of the season at Barnsley. Saunders agreed it is a run he has to break if Crawley are to avoid relegation. “The team hasn’t won away from home for months and I have to get to the bottom of it because our home form is really good. We are three undefeated at home and should have won against MK Dons. “At home, it was a great result against Preston but then we could here and I thought we were in control of the game. Gwion has a chance to put us 2-0 up right after half-time and he will be disappointed with his finish then we have given too many fouls away. He had some tightness in his hamstring so the bext thing I could do was take him off. “Every time the ball is dead it gives them the chance to put it in the area which gives them their best chance of scoring as they have about five players over 6ft 4ins tall. Sometimes its because you don’t get to the ball first, so maybe its a bit of mental sharpness too.